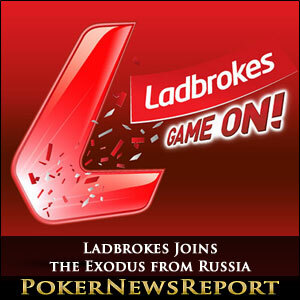 Ladbrokes has joined a growing number of online gambling companies to withdraw from the online gambling market in Russia following an operational review. Last weekend, Ladbrokes sent out thousands of emails to its customers in Russia, advising them that the company would no longer provide a service to Russia following an operational review. Apparently the decision had been taken to comply with changes in European and UK online gambling legislation which restricts operators from providing a service to more than 3% of “grey” areas. In addition, Ladbrokes banned players from Finland – where online gambling activity is controlled by the country´s gambling monopolies – and Portugal, where new legislation is expected in 2015. The company has also pulled out of Romania after the country increased the license fee for casinos to €100,000 each year. The withdrawal of service from Russia, Finland, Portugal and Romania brings Ladbrokes´ total number of “banned territories” to 68 after pulling out of multiple European jurisdictions earlier in the year – including Hungary, Norway and Switzerland. However, it is almost certain that the biggest loss in revenues will be from Russia, where legislation was recently passed limiting online gambling to just a handful of outlying areas. However, even before the legislation was enacted, several other online gambling companies had said goodbye to the Communist state. Betfair and Unibet stopped accepting new players after Russia started ISP blocking gambling domains in March, and BetClic-Everest withdrew from the Russian market completely in April. PokerStars is said to be watching the situation closely after pulling out of thirty “grey areas” last October to comply with European and UK legislation. The consequence of online poker sites pulling out of unregulated countries has been a growth in the volume of traffic at unregulated poker sites. The online poker traffic monitoring site – PokerScout – reports that worldwide cash game traffic is down 17% from this time last year, however also notes substantial increases in the level of traffic on offshore networks. Bovada Poker, the Merge Gaming Network, Winning Poker Network and Chico Network all experienced noticeable growth throughout 2014, while the Equity Poker Network was only launched in November 2013 and already commands a higher volume of traffic than any regulated poker site in the US. What Would Happen if More Grey Areas Emerged? With the exception of Russia, many of the “grey areas” from which online poker sites have withdrawn are relatively minor jurisdictions. For example the Vatican, Tanzania and Malaysia were among the markets that PokerStars pulled out of last October and the loss of these markets would have little effect on liquidity at the poker tables. However, China, India, Brazil, Canada and Australia are all countries in which there is no legislation governing online gambling, and the loss of these countries – should more poker sites choose to withdraw their services from these “grey areas” – would result in a significant downturn in the fortunes of regulated online poker sites (Ladbrokes pulled out of Canada last September). With legislation stalling in the US, the short-term future for online poker is itself looking a “grey area”.